Preheat the oven to 350º F. In a mixing bowl, combine the graham cracker crumbs, brown sugar and melted butter until the mixture is wet and will stick together when pressed. Spread the crust into the bottom of a 9×13 inch pan. Use your hands or a heavy bottom flat cup to firmly press the crumbs into the pan. Bake the crust for 10-12 minutes. Allow the pan to cool completely before moving forward. You can place the pan in the fridge to help speed up the process. You could also bake the crust a day in advance. In a small pot over medium-low heat on the stove, combine the chocolate chips and vegetable oil. Stir occasionally until the chocolate is completely melted. Remove from the heat. In a mixing bowl, use an electric mixer to beat the cream cheese until smooth, 1-2 minutes. Add in the melted chocolate, heavy cream and powdered sugar, beat until smooth and combined. Spread the cheesecake layer over the cooled graham cracker crust. Place the pan in the fridge while you prepare the pumpkin filling. In a mixing bowl, beat the milk and 2 packages of french vanilla pudding mix until combined. Once the pudding is thick, beat in the pumpkin puree and pumpkin pie spice. Spread the pumpkin filling over the cheesecake layer. Place the pan in the fridge while you prepare the chocolate whipped cream. Place a metal mixing bowl and beaters in the freezer for 10 minutes. Remove the bowl from the freezer, add the heavy cream, powdered sugar, and cocoa powder and beat for 3-5 minutes, or until stiff peaks form. Spread the chocolate whipped cream over the pumpkin filling. Place the pan in the fridge for at least 2 hours before serving. Top with chocolate shavings if desired before serving. 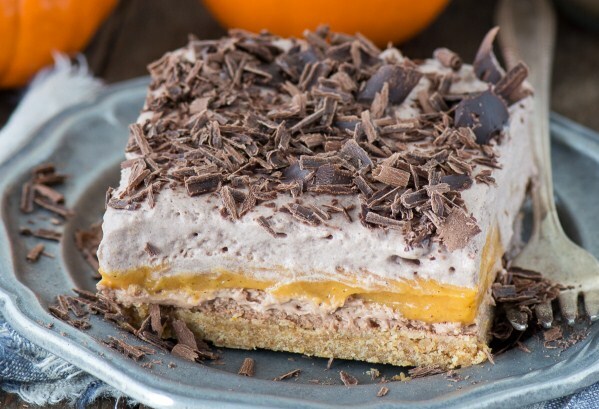 Use a sharp knife to cut the dessert into slices, be sure to cut all the way through the graham cracker crust.